There are a lot of things that can go wrong with recycling at any institution, be it a school, university, library or business. 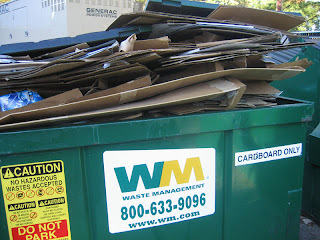 People can think recycling is going on, when in fact all recyclables are ending up in the dumpster. So much can go wrong because, for recycling to work, so much has to go right. Everyone needs to know what's recyclable and what's not, and act on that knowledge. The containers in the building need to be strategically placed and color coded, and then the recyclables have to miraculously make the journey all the way to the big containers behind the building. Anywhere along the line, the system can break down. Indifference is contagious. Idealism quickly turns to cynicism when a conscientious employee finds out that his or her carefully sorted recyclables are getting thrown away by the custodian. Recycling is mandated in the state of New Jersey, but from what I've seen, effective recycling is a rarity in buildings and at public and private events. To be successful, recycling requires participation by everyone. Everyone is responsible for the outcome, which is to say no one is. The cumulative effect of insignificant-seeming acts by insignificant-feeling people determines the result. Adding to the problem, beyond widespread indifference, is what seems to be a cultural taboo against checking the rollout bins and dumpsters behind buildings. There is no other way of telling what recyclable "product" a building is producing. This is basic quality control--something we expect to be done with every other commodity in commerce, yet shun when it comes to recycling. As you can see by the above photo from the high school dumpster, a lot has been going wrong. Cardboard, bottles, aluminum cans--all were getting tossed in with the trash when a few of us sought to resurrect a recycling program that had been stopped altogether through the summer. When recycling was reinstituted in September, one thing immediately started going right. The custodians mostly do a good job of recycling cardboard. Other materials, like cans, bottles, juice boxes and paper, are also now getting recycled consistently at two of the four elementary schools--Riverside and Little Brook--thanks to more than one hundred emails between school administrators, staff and a particularly persistent community volunteer, and most importantly a few passionate teachers who have helped institute a program in which the kids carry recyclables from each classroom to central rollout bins, and the custodians help monitor the kids' recycling during lunchtime. Other than custodial supervision of recycling at lunchtime, the program at the schools aims to take custodians out of the picture as much as possible. The key custodians are those that work after hours, unsupervised, and for them, recycling is extra work. 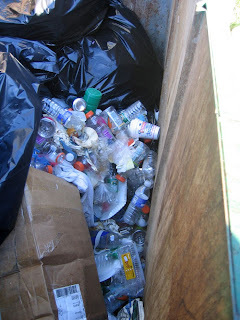 Since many people are careless, the custodians frequently encounter a lot of trash mixed in with recyclables. Who can blame the custodians for not wanting to sort through someone else's trash? As of late November, there is no recycling of bottles/cans/milkjugs at Community Park Elementary, and there has been no news as to how Johnson Park is doing. At the high school and middle school, the situation is particularly challenging, since the kids and teachers don't stay in one room all day, and so no one is responsible for any one room. The two schools have different problems. Though some recycling of bottles and cans is happening at the middle school, there is none at the high school, despite recycling receptacles in the cafeteria. Five rollout bins stand behind the school, ready for bottles and cans, and each week they are empty, except for an occasional black plastic bag with unwashed cans from the kitchen. The bag is a contaminant. Despite the hundred-plus emails buzzing around, there has been zero recycling of paper at the middle school all fall (paper recycling is reportedly going to begin after Thanksgiving), and next to none at the high school. The bin in the picture shows shredded paper, still in a plastic bag, which is a contaminant. 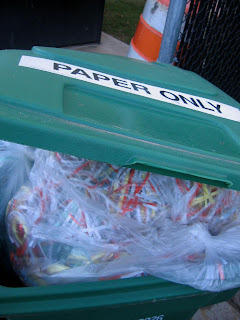 This week, however, for the first time, a "Paper Only" bin was completely filled with mixed paper, loose, unshredded, with no plastic bags. Thanks likely goes to the high school's student environmental group, which has been working to overcome the entrenched institutional realities and perceptions that make recycling such a challenge. Past personal experience suggests that there is no recycling going on at school events, like school picnics or Back To School Nights. 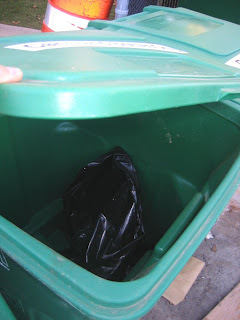 If any recycling containers are present, they are typically unpaired with trash bins, insuring that they will be highly contaminated with trash, which in turn insures that their contents will be tossed in the trash dumpster by the custodians. If you’re trying to reduce energy use at home or at the office, one of the handiest aids is a Kill-a-Watt. There are other similar devices on the market, but this is the most widely known. You can use it to measure how many watts most any plug-in device is using in your home. Since electricity makes no sound, most people are in the dark about what is consuming electricity in the house at any particular time. Though not available in retail stores for some reason, the device can be purchased via the internet for about $25. Plug your computer, toaster, various power strips, TV and so forth into it and you’ll undoubtedly find some unexpected energy drains. If you leave the appliance plugged into the Kill a Watt for a couple weeks, it will give you the total energy consumed in that time period, which will provide a good sense of how much the appliance uses per year. My thin-screen computer and All-in-1 printer use much more energy than the ones they replaced. In other words, as the need to reduce our carbon footprints becomes ever more pressing, many of us are unwittingly switching to the electronic equivalents of SUVs. New TV: Holding off on that one, but likely to be a big increase. A thin screen similar in size to our old 19" TV uses a similar amount of energy, so the new models are slim in looks only. It's called a dehumidifier, and it runs and runs. Mine is an Energy Star model, but that doesn't keep it from drawing what averages out to a constant draw of three or four hundred watts during the summer, and that's with it's thermostat set at the highest (70%) humidity level. A lower setting would cause it to run even more. Multiply that consumption rate by all the houses with basements in NJ, and you have a major contributor to energy demand, and therefore global warming. It may be worth looking into whether a ventilation system using fans would achieve adequate results, simultaneously helping to reduce any risk of radon accumulation. 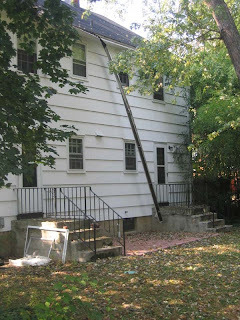 Another measure is to make sure the ground slopes away from the house, and that downspouts discharge well away from the foundation, to reduce the amount of moisture seeping through the basement walls from the soil. The word "upkeep" may well have had its origin in the high-altitude art of keeping gutters from spontaneously turning into downspouts. If they aren't kept up, they fall down, which is what happened to the rental next door. People don't naturally turn their attention to the condition of their gutters, but thanks to the inspiration of my neighboring landlord's neglect, I was moved to take action on my own. Most likely what happened next door was that autumn's first falling leaves clogged the gutter, rainwater filled them up, and the resultant weight pulled the old nails loose from the fascia board. So I've been spending some quality time replacing every other old nail on my gutters with a screw, and adding gutter guards so that I don't have to keep climbing up there to clear them of leaves. Where would we be without inspiration, whatever its source? In case you're wondering why household batteries can now go in the trash, here is the explanation on the Mercer County website. Rechargeable batteries, on the other hand, are usually recyclable at RadioShack and other similar stores. Household batteries may be placed in your normal trash due to the fact that mercury levels have been significantly reduced and fall within DEP standards. Batteries can no longer be recycled curbside. I just called up the Mercer County Improvement Authority, and they confirmed that alkaline batteries are safe to put in the garbage. They had no suggestions about how to recycle them. As stated on Princeton Township's website (www.princetontwp.org/n99insert2.html), rechargeable batteries can usually be recycled at your local Radio Shack or other similar store. For other sorts of batteries, you may want to consult the Mercer County website (http://www.mcia-nj.com/recycling.html). Our elementary school was collecting batteries for awhile--something to keep an eye out for. 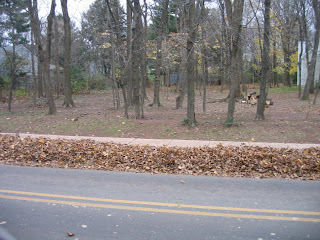 If the borough ordinance forbids putting lawn clippings out on the road, why do the street crews keep taking them away? Good question. Even in a government bureaucracy as small as Princeton Borough, there are contradictions. Though street crews are showing a generous nature, the result is that neighbors imitate other neighbors, and soon the whole block is violating an ordinance intended to prevent high-nitrogen yardwaste from polluting the nearby creek via storm sewers. 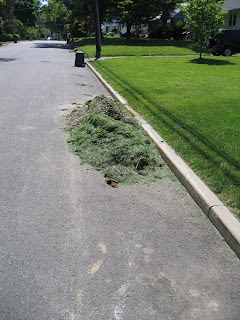 Word has it that the borough may eventually start fining homeowners who put grass clippings out on the road. The Mercer County Master Gardeners recommend leaving grass clippings on the lawn (http://www.mgofmc.org/successfullawncare.html). If you don't, you're lawn loses valuable nitrogen that must then be replaced by buying more fertilizer. The worst thing to do with grass clippings is to pile them up. The high nitrogen and lack of aeration favor anaerobic bacteria that raise a stink if the pile is disturbed. Meanwhile, in the township, it appears that there is no yardwaste pickup at all in June and August. More info can be found at www.princetontwp.org/pubworkmain.html. I almost missed my big chance to recycle old computers that had been sitting in the garage for most of a year. They weren't mine. 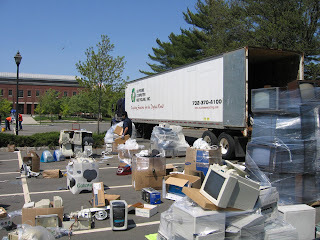 I had seen them put out on the curb for the garbage, and couldn't stand the thought of all that lead and other heavy metals in the monitors heading to the landfill. Princeton Township lets its residents drop off computers for recycling year-round, but we boroughins end up waiting for the big annual recycling day in the township parking lot on Witherspoon. Adding to the environmental good feelings of the event, it turns out that the computers (and TVs and various other electronic stuff accepted at this annual event) are not shipped oversees to some unregulated smelting plant, but are actually recycled right here in New Jersey. 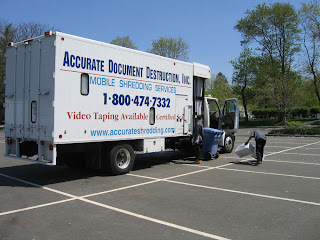 Residents were also encouraged to bring in old financial documents for shredding. The whole thing was organized by Princeton Township's recycling coordinator, Janet Pellichero, with help and impetus from the Princeton Environmental Commission. 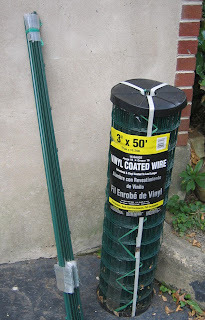 If you missed it, either wait until next year, check out what recycling days Mercer County offers (http://www.mcia-nj.com/recycling.html.) or, if you live in the township, check out http://www.princetontwp.org/computer_recycling.html for instructions on how to recycle your computer and related equipment. My dog has been taking me on daily around-the-block tours of our neighborhood. It allows him to catch up on the latest canine comings and goings in the 'hood, and every two weeks I get to take a reading on the state of recycling in town. Basically, people need to bone up on what's recyclable and what's not. I see a lot of (pardon the sports analogy) Hail Marys getting thrown into the recycling bins, that is, stuff that should be recyclable but which in our imperfect world could actually cause problems at the recycling plant. So let's get our recycling chops together, and learn what goes in the recycling bins, and what has to go in the trash. DON'T put your recyclables in plastic bags! Put them loose in the bins. Paper can be stuffed in paper bags. DON'T recycle pizza boxes of any kind. The delivered ones are greasy. Frozen food boxes look clean, but have something in them that relegates them to the trash. Styrofoam belongs in the garbage. Check township website for more info. DON'T recycle toys. They either get a second life via a yardsale or meet their ignominious end in the trash can. I have an idea for a Fix-It Museum in town, where refugees from the throw-away society get to see real people fixing things for re-use, but that will have to wait. No light bulbs! No glass other than bottles and jars. The glass in drinking glasses is apparently different from bottle glass. To recycle florescent bulbs, which contain traces of mercury, check the websites below for dropoff locations. Metal and plastic lids are recyclable, but take them off before putting them in the bins. A few of those windowed envelopes won't hurt, but as a whole, the windows need to come out. Washing containers before putting them in the bins helps keep odors down, but I recently heard that the process of melting down recyclables for reuse burns all the impurities off. Check out in particular the Mercer County brochure. It's got PICTURES! Thanks to Princeton Township's Janet Pellichero for helping with this post.